The fall of the nearly 30-year regime of Sudan’s president Omar al-Bashir was almost entirely due to the heroism and steadfastness of the Sudanese people – ordinary people, youth, women and the urban poor – rallying without fear since December 2018 until April 11, 2019 and beyond. Led initially by the Sudanese Professionals Association (SPA) and by civil society, it was later embraced by traditional opposition parties and armed rebel groups. Dozens of demonstrators were killed and hundreds arrested and abused by a regime skilled in repression and violence that had successfully suppressed for years various waves of civil unrest through a combination of force and the illusory offer of dialogue and reform. The initial impression made was less of a coup d’etat overthrowing a regime than a regime making an internal course correction. The Defense Minister said that the Council would remain in power for two years, maintain a state of emergency for three months, and enforce a nightly curfew. It didn’t turn out that way. Ibn Awf made it clear in that first statement that the move against Bashir was made by the Sudanese Armed Forces (SAF), the police, the National Intelligence and Security Service (NISS), and the shock troops of the Rapid Support Forces (RSF). But almost immediately, the fissures in the ruling cupola appeared. 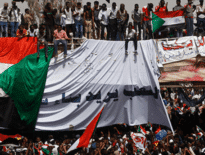 Little noticed at first was the fact that the RSF refused to take its seats in the interim military council and publicly called for a much stronger embrace of the demands of Sudan’s civilian demonstrators, including a quicker return to civilian rule. For those who know Sudan, this was an interesting turn of events. The RSF, forged by Khartoum out of the violence of the Darfur conflict, is the latest iteration of the notorious Janjaweed, paramilitary forces drawn from Darfur’s Arab tribes and used by the regime in bloody counter insurgency work, first in Darfur and later in other border areas of Sudan and eventually, in 2013-2014, even in suppressing demonstrations in Khartoum. Darfur’s Arab tribes were certainly victims who had turned into victimizers. Mostly poor and poorly educated, they were actually little different from marginalized tribes all along Sudan’s periphery, from their rivals and victims in Darfur to the Misseriyya of Kordofan and the Beja of Eastern Sudan. Like colonial authorities, the powers that be in Sudan played one tribe against another, punishing one while rewarding another. Such behavior had been honed in the decades long war against the South Sudanese, but continued after the independence of the South in 2011. Bashir and the NCP merely continued and accelerated practices previous governments had implemented to maintain control. Musa Hilal initially seemed like Khartoum’s main Janjaweed commander and favored interlocutor. In 2008 he was named an advisor to the Ministry of Federal Affairs. He was elected to Sudan’s parliament as part of Bashir’s NCP. But Hilal tried to maintain his power base in Darfur and violently resisted merging his forces into the Rapid Support Forces headed by his rivals. In November 2017 he was arrested by Khartoum and as of early 2019 remained in prison. Hemeti would in the end prove to be a more adroit power player. The nephew of the traditional chief of the Awlad Mansour section of the Mahariyya clan of the Rizeigat, Hemeti ostensibly worked for NISS after the creation of the RSF in 2013 and reported to a NISS general based in Khartoum. Over time, Hemeti would become more independent of NISS and seems to have been able to play NISS and SAF against each other while giving Sudan’s President an autonomous “third option” to use against the much larger army and intelligence services. While creditably accused of human rights abuses and war crimes in Darfur, the RSF also benefited from being used as brutal shock troops at the beck and call of Khartoum beyond Darfur; in 2016, a decree placed them directly under presidential control. This reputation of being a force that is both essential and expendable, a sort of Praetorian Guard dependent only on the Sudanese head of state, would see the RSF sent to fight in Yemen as part of Sudan’s contribution to the Saudi-led coalition effort against Iran-backed Houthi rebels. It is in Yemen that the RSF solidified a connection with then Brigadier Abdel Fattah Burhan. Burhan also had a connection with Sudan’s border guards where some of these Darfur Arab paramilitaries had served. Burhan’s role as coordinator for the Sudanese war effort in Yemen also placed him in contact with allies in the United Arab Emirates and Saudi Arabia. In contrast with the aloof and arrogant Ibn Awf, Burhan was photographed meeting with demonstrators, at the same time as the RSF openly sided with demonstrators and demanded a stronger position by the interim military council in aligning with the popular will. Less than 48 hours after the removal of Bashir, Burhan would be sworn in as head of the council. Not only would Ibn Awf fall from grace, but also NISS chief Salah Gosh, the onetime master and creator of the RSF, would fall as well. His replacement Shams al-Din al-Kabashi was a graduate of the same batch at Sudan’s military college as Burhan. 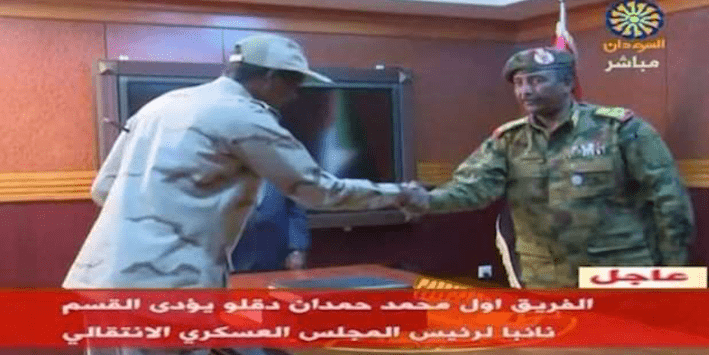 And stunningly sworn in as deputy to Burhan on April 13, ostensibly interim “Vice-President” of the military council was the 46-year old RSF commander Muhamad Hamdan Dagalo “Hemeti.“ This was an astonishing, meteoric rise to power in less than 10 years, from Darfuri Arab paramilitary field commander to ostensibly the second most powerful position in Sudan. Given the volatile political situation in Sudan, there is no guarantee that the correlation of forces in place right now will last. Sudan is a political and economic basket case and will face difficult times even with a competent civilian government, should one emerge. The masses have seen the beginnings of change and clearly want much more. It is not clear how long the surprising honeymoon between the new military leadership, including the RSF, and demonstrators will last. And there is no guarantee that it will all not end in tears, although Western diplomats have begun meeting with Hemeti, and the UAE and Saudi Arabia have promised new assistance to Sudan. But in the end, the brutal henchmen that Khartoum had unleashed to bloodily impose its will in Darfur would turn against him and help give Sudan a chance – how much of a chance is still unclear – for a better future.